As tax time approaches it seems fitting to revisit our finances. 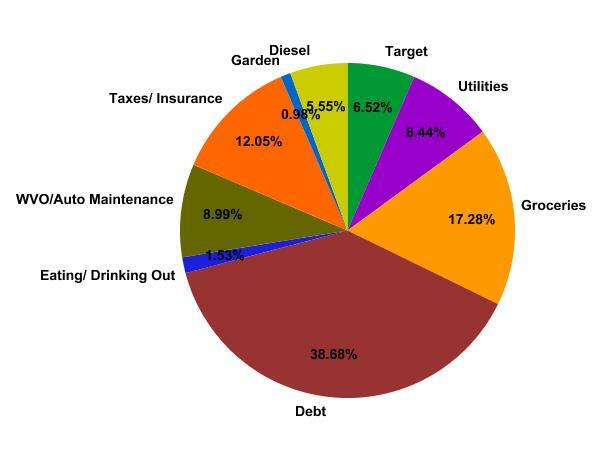 This post documents the spending we have done to support ourselves as individuals, and has nothing to do with our investment in the farm or our property, although it does include routine maintenance. As an example, it does not include the new duct work for our heater, but it does include two new toilet seats that replaced broken ones (they don't make 'em like they used to, especially considering one of the new ones has already been broken.) There are a few areas that are hazy, and those will be addressed later, feel free to ask for clarification or anything else in the comments. A breakdown by category, from simple to complex. Eating out ($468): We only do this on special occasions or when we're having a particularly bad day, and considering it's statistical insignificance I'm not complaining. Garden ($299): This is one of those categories that's confusingly documented. The garden was split into recurring costs (seeds, soil amendments, etc.) and infrastructure (fencing, trellis, etc.) In theory we can get a lot of the recurring stuff down to nothing, producing our own manure, saving seed, etc., which is why I chose to keep track of those things here. As it stands I think we got our money's worth out of the garden, even including the $620 we spent on irrigation, tiller repair and other infrastructure costs. Taxes/Insurance ($3693): Unfortunately these costs are fixed, and climbing. Our homeowners/auto policy went up 10% this year, so I called around to other underwriters and found it was still the cheapest. Our taxes are low for the region, although we will qualify for an agricultural assessment, and the associated reduction, once we produce more than $5,000 in goods, which may be this year! Utilities ($2,586): This represents our costs in electricity, phone, internet and propane. Notice we don't pay for water or sewer, as we have our own well and septic system, albeit a pretty outdated one. We were able to get our phone costs down substantially in 2010 by switching from one Iphone (~$95/month) to two disposable "burner" cell phones ($3/month) and an internet based landline, ($7/month, now free through Google.) We plan to install a passive solar hot water heater within the next few years to cut down on those costs, but the others are pretty much fixed. Things you can buy at Target ($1998): This category is self explanatory. Clothes, dishes, dog food, soap, etc all ends up here. Also, Christmas gifts which take up a fair portion, along with home maintenance costs like gasoline for the lawn mower, and medication. Not much we can do here either. These variables need a bit of explaining: Guaranteed costs are those that we'd spend regardless of what cars we owned: oil changes, windshield wipers, fluids, etc, along with tractor maintenance. 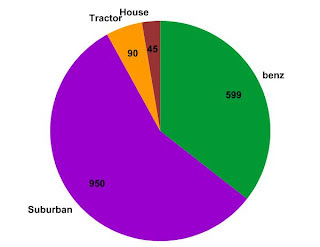 Grease costs are those costs associated with filtering and storing Waste Vegetable Oil for fuel. Suburban and Benz are the costs associated with those specific vehicles and their well thought out or poor designs. 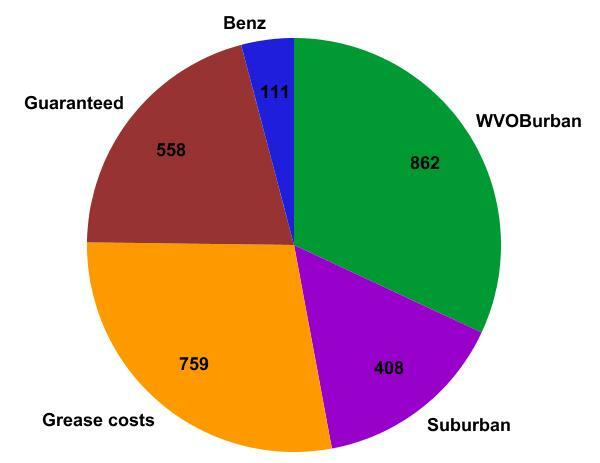 WVOBurban is a subset of costs that are both WVO and Suburban related, due to the Suburban's distaste for WVO. This number is included because if we just ran on regular fuel the cost wouldn't exist, but it's also the Suburban's fault as a more robustly designed vehicle wouldn't need these repairs. It is also important to note that these costs are for parts and supplies only, as I do all of our repair work myself. 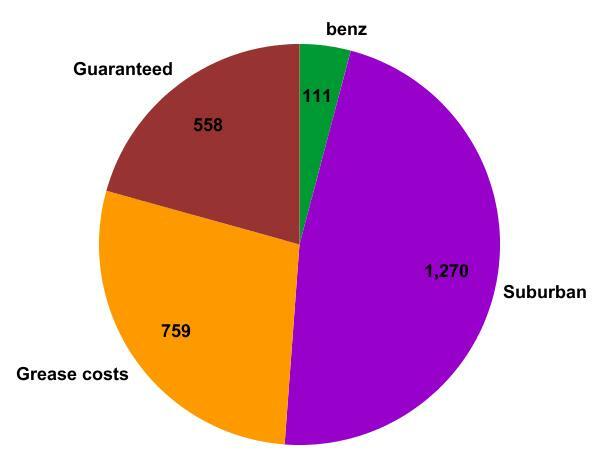 As you can see, the Benz is a lot better designed than the Suburban, as after 30 years it only had $111 of unexpected maintenance needed. All together we spent $3,323 on fuel this year, and if we had just used Diesel we'd have spent $5,687 which represents a savings of $2,365, or $200 a month. Of course this does not include all our labor, which I'd estimate at 15 hours a month. I could see costs in the "Grease" and "WVOBurban" categories going down, but I could also see them staying the same. Any way you slice it $210/car/month isn't too bad, I know people who spend that much filling their tanks. Another way to look at would be that anything we could do to drive less would lower this expense as well, especially if we could get down to one car. Currently I'm shopping for a pickup truck with a much more robust WVO friendly engine, a 1994-1998.5 Dodge with a Cummins engine. We really need a pick up to cart around stuff, and 4WD to get to the places the stuff is. Debt ($11,855): This ones a doozy. This number represents the minimum we are expected to pay each year, between our mortgage and student loans. This represents 25% of our pre-tax income!! While most of it is at favorable interest rates, we push all of our available cash into this category, in addition to the minimum payments we put $8,000 towards Becky's student loans in 2010, which is nothing to laugh at. Groceries, including adult beverages ($5295): Without doing a full analysis I'm willing to bet that 1/3 of this is just adult beverages. We like our drink at TBA farms, and with all the entertaining we find ourselves surrounded by alcohol consumption. We do make as much of our own beer and wine as we can, and we have plans to scale up in 2011. This doesn't necessarily save us a lot of money, but it does allow us to have much nicer beer and wine for a much lower cost. Meat and produce that we have grown here on the farm is not included in this category, and while produce can be seen roughly in the Garden category the meat is not accounted for. This year as we begin to sell meat I'll be able to put a price on it, and most likely it will get it's own new exciting heading. In summary, I'm proud of how we've managed our money. We went without in some cases, and when it was time to treat ourselves we did it sparingly. We cut what few costs were left to cut, and in 2011 I hope to keep going, with significant cuts in WVO/Diesel costs, and groceries. Our minimum debt payments have been reduced as well, so we hope to pay off even more principal. As a reward for those who have made it this far, videos of piglets nursing violently and trying to crowd surf! !